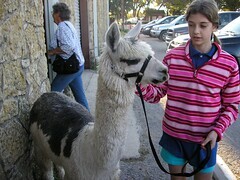 This weekend is Kid'n'Ewe in Boerne, just north of San Antonio. 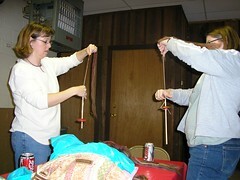 Although it's not exactly Rhinebeck or Maryland Sheep and Wool, it's a lot of fun. The weather even cooperated. Although it was around 90 yesterday, the high today was about 65, allowing us to wear hand-knits. 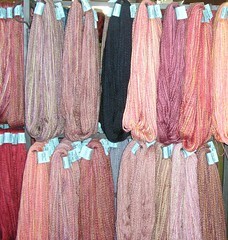 And for a lot of us, Kid'n'Ewe is all about the Brooks Farm Yarn! Julia and Christine arranged a lunchtime meet-up of Texas knitbloggers (and knitters in general). It was great to see some of the people we met at the Yarn Harlot in Austin in July, plus meet some new folks. San Antonio was well-represented by Susan (and Ken, of course), Kim, Amy, Amanda, Enid, Courtney, and David (you should go wish him a happy belated birthday). 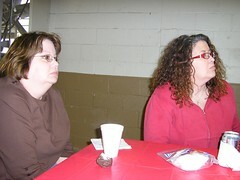 I also dragged along my sister Linda and our friend Jody. Linda hadn't knitted in a couple years, and Jody had never knitted, but by the time we left, they had each bought a skein of Brooks Farm Four Play and a pair of needles, and were knitting. 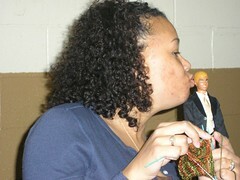 Yes, we taught Jody to knit - and tomorrow she learns to purl! Kim was glad to see Ken again. 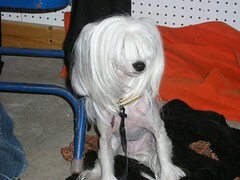 and a doggie named Velcro on one, too. 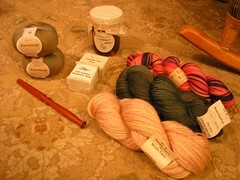 Clockwise from the front left: a bloodwood nottespinne from Hokett Would Work, two skeins of Jojoland Harmony (lace weight wool), two bars of soap and a jar of wildflower honey from del jardin of Poteet, Texas, a skein of Hill Country Yarn sock yarn that I won as a door prize (door prizes! ), a skein of just-barely variegated green Brooks Farm Four Play, and one of Brooks Farm Primero in very pale pinky-neutrals. All in all - a very fun day!